The exhibit entitled “Ancient Thrace. The Odrysian Kingdom” is set to be hosted by the Louvre in Paris between April 15 and July 20, 2015. It is to display several Thracian treasures featuring a total of 1628 items which will be insured for at least EUR 165 million, the Bulgarian daily Standart reports. However, in addition to the impressive treasures the exhibition will include pottery and other items seeking to present for the first time the lifestyle and customs of the Ancient Thracians in their entirety. The Odrysian Kingdom, a union of Thracian tribes dominated by the tribe of the Odrysians (also known as Odrysea or Odrusai), was the most powerful state of the Ancient Thracians. It existed from the 5th century BC till its conquest by the Romans in 46 AD on the territory of most of modern-day Bulgaria, Northern Greece, Southeastern Romania, and Northwestern Turkey. According to estimates by French experts, Bulgaria’s priceless archaeological finds from the period of Ancient Thrace will be visited by more than 4 million people during the three-month period of what will become the first ever Bulgarian exhibition at the Louvre. Thus, the citizens and guests of Paris will be able to see most of the world famous Thracian treasures: the Panagyurishte Gold Treasure, the Rogozen Treasure (gold and silver), the Borovo Silver Treasure, the Letnitsa Treasure (silver and bronze), the Mogilanska Mound Treasure (also known as the Vratsa Gold Treasure), the Zlatinitsa Mound Treasure (gold and silver), and the bronze head of Seuthes III, king of the Odrysian Thracian Kingdom between ca. 331 BC to ca. 300 BC., which was dug up in 2004. The bronze head of Seuthes III alone will be insured for EUR 13 million while the most precious threasure in the exhibit, the Panaguyrishte Gold Treasure, will be insured for EUR 50 million, the report said. The Louvre exhibition of Ancient Thrace will also be unique because it will feature for the very first time Bulgaria’s latest gold treasure find – more than 180 gold items discovered in October 2014 by Prof. Diana Gergova at the Sboryanovo Archaeological Preserve near the northeastern Bulgarian town of Sveshtari (which is famous for its Thracian tomb) belonging to the Thracian tribes of Getae (also known as Gets) who were also part of the Odrysian Empire for a certain period of time. The Ancient Thrace exhibition in Paris, however, will not be limited to showcasing the impressive treasures but will also seek to present the lifestyle of the Thracians as well as their relations with other neighboring civilizations such as Ancient Greece and Persia; that is why it will also feature a myriad of other artifacts such as bronze coins and pottery. The items for the Louvre exhibit will come from a total of 12 museums in Bulgaria. They have already been selected by a 10-member team led by Prof. Totko Stoyanov from Sofia University “St. Kliment Ohridski”. What is more, 10 foreign museums holding Thracian items found in Bulgaria are also expected to contribute to the exhibit in Paris. Bulgaria’s National History Museum chaired by Bozhidar Dimitrov is in charge of collecting the designated items and restoring the ones that are in need of restoration. One such item, according to Dimitrov, is a hydria, an ancient ceramic vessel used for carrying water or wine, found in the 1920s by Bulgarian archaeologist Bogdan Filov (also known for being the country’s controversial Prime Minister in 1940-1943). The hydria in question has been stored in the soil it was original found in, and is now to be showcased for the first time. Another impressive item to be shown at the Louvre that Dimitrov noted is a 6th century BC statue of a young athlete found in the town of Atiya on Bulgaria’s Black Sea coast. “For the first time the idea is not to focus explicitly on Thracian gold but to show the life and customs of individual Thracian tribes as well as their interaction with other communities… We are also showcasing the Greek colonies along Bulgaria’s coast because the Greeks were neighbors of the Thracians and they influenced one another,” explains Prof. Totko Stoyanov who will be the curator of the exhibit. In his words, the event will seek to present Thracian tombs in their entirety featuring not only the precious gold finds but also all the other items that give an impression of how the Thracians viewed the afterlife. Perhaps the most important treasure from Ancient Thrace that will not be included in the Louvre exhibit is the golden mask of Teres I, the founder of the Odrysian Kingdom (r. 460-445 BC), which was discovered in 2004 by the team of renowned Bulgarian archaeologist Georgi Kitov. According to Prof. Stoyanov, Teres I’s much celebrated gold mask does not fit the Paris exhibit’s concept of presenting in full the lifestyle of the Thracian tribes because it came from a single grave. “We are showing ancient wine objects with a magical purpose because we wish to demonstrate the colors of life with the beliefs and the customs so that the audience can feel as much as possible what type of people lived back then. When we showcase just the gold and the silver people just stare in awe but are unable to sense what kind of people are behind those crafts or how they were used in their rituals,” he explains. According to the Standart daily, the restoration of the artifacts for the Louvre exhibition will be sponsored by the French side with about EUR 300,000. However, the contract with the Bulgarian Culture Ministry has not been signed yet, and Culture Minister Vezhdi Rashidov has allocated more than EUR 8,000 so that the restoration work could begin in time. The head of Bulgaria’s National History Museum, Bozhidar Dimitrov, has pointed out that the idea for the Ancient Thrace exhibit in the Louvre came in 2011 when former and present Culture Minister Vezhdi Rashidov negoatited an agreement for long-term cultural cooperation between Bulgaria and France. “Museums of this rank are booked for years in advance. [Back then] Bulgaria was assured that the exhibition will take place in early 2015. I am glad that the Louvre has lived up to its part of the agreement,” Dimitrov says describing the event as an “incredible honor”. He emphasizes that will be the first ever Bulgarian exhibit at the Louvre, reminding that 40 years ago renowned Bulgarian archaeologist Prof. Alexander Fol, the founder of tracology, the study of Ancient Thrace, together with Lyudmila Zhivkova, the daughter of Bulgarian communist dictator Todor Zhivkov, who was in charge of cultural policies, managed to organize a Paris exhibit dedicated to the Thracians but that it was not held in the Louvre. As part of the official museum exchange with France several Bulgarian museums providing Thracian artifacts for the exhibit in Paris will showcase exhibits from the Louvre from Ancient Egypt and the Etruscan civilization which will be seen for the first time in Bulgaria. Odrysian Kingdom, Odrysians – The Odrysian Kingdom, a union of Thracian tribes dominated by the tribe of the Odrysians (also known as Odrysea or Odrusai bearing the name of a mythical ruler, Odryses or Odrisis, (ca. 715 – ca. 650 AD), was the most powerful state of the Ancient Thracians. It existed from the unification of many Thracian tribes by a single ruler, King Teres, in the 5th century BC till its conquest by the Romans in 46 AD on the territory of most of modern-day Bulgaria, Northern Greece, Southeastern Romania, and Northwestern Turkey. The Getae or Gets were Thracian tribes inhabiting the regions to either side of the Lower Danube in today’s Northern Bulgaria and Southern Romania. The Triballi were a Thracian tribe inhabiting the region of modern-day Western Bulgaria and Southern Serbia. Teres I (r. ca. 475 – ca. 445 BC) was the first king of the Odrysian Kingdom uniting about 40 Thracian tribes. He was succeeded consecutively by his sons, Sparatocos (r. ca. 445-ca. 431 BC) and Sitalces (r. ca. 431 – ca. 424 BC). Seuthes III was a king of the Odrysian kingdom of Thrace from ca. 331 BC to ca. 300 BC, at first tributary to Alexander the Great of Macedon. In 2004, Bulgarian archaeologists discovered Seuthes III’s tomb at the Golyama Kosmatka Mound near his capital Seuthopolis (close to today’s town of Kazanlak), part of the Valley of Thracian Kings, one of the most famous finds being a lifelike bronze head of the ruler. The Panagyurishte Treasure, also known as The Panagyurishte Gold Treasure, was found in 1949 by three brothers – Pavel, Petko and Michail Deikovi, who worked together at the region of Merul tile factory near the town of Panagyurishte, Bulgaria. It consists of a phial, an amphora and seven rhytons with total weight of 6.164 kg of 23-karat gold. All of the objects are richly and skilfully decorated with scenes from Thracian mythology, customs and life. It is dated to the 4th-3rd centuries BC, and is thought to have been used as a royal ceremonial set by the Thracian king Seuthes III. The Rogozen Treasure was discovered by chance in 1985 by a tractor driver digging a well in his garden in the Bulgarian village of Rogozen. It consists of 165 receptacles, including 108 phiales, 55 jugs and 3 goblets. The objects are silver with golden gilt on some of them with total weight of more than 20 kg. The treasure is an invaluable source of information for the life of the Thracians, due to the variety of motifs in the richly decorated objects. It is dated back to the 5th-4th centuries B.O.T. The Borovo Treasure, also known as the Borovo Silver Treasure, consists of five silver-gilt decorated vessels found in 1974 while ploughing a field in Borovo, Northeastern Bulgaria. The set has a bowl, a rhyta jug, and three rhyta, the largest of them with a figure of a sphynx and an inscription reading: “[Belongs to] Cotys from [the town of] Beos.”, as well as the name of the craftsman, Etbeos, leading to speculations that the treasure may have been a gift to a local Getic ruler from Odrysian King Cotys I (r. 382-359 BC). 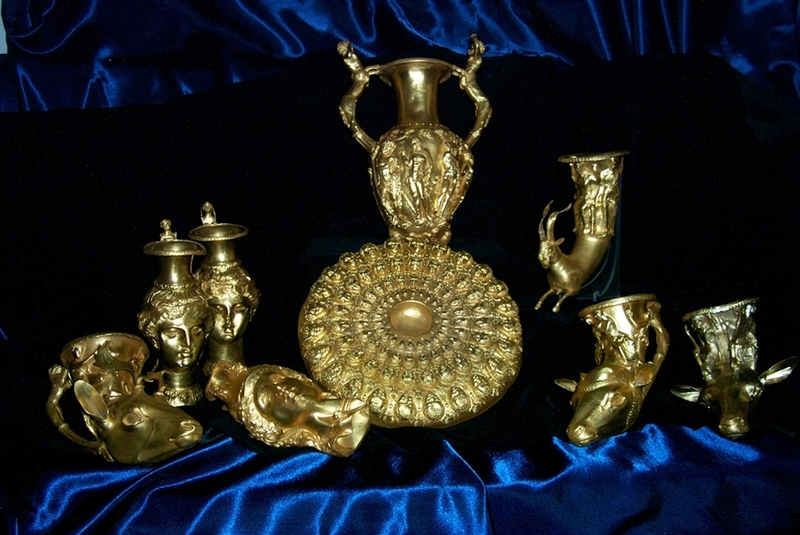 The Letnitsa Treasure is dated back to the 4th century BC. It was found by accident in 1963 during a dig near the town of Letnitsa in Central Bulgaria in a bronze vessel. It consisted of a large number of small decorated silver items as well as a Thracian warrior’s decorated horse ammunition found nearby. The Mogilanska Mound Treasure, also known as the Vratsa Gold Treasure, was found during excavations of a mound (which turned out to hold three tombs) in the downtown of Northwestern Bulgarian city of Vratsa in 1965-1966. The treasure found with the skeletons of people and horses, and chariots, consists of a golden crown of laurels, 47 gold appliqués, 2 golden earrings, 4 silver phialai, a silver jug, a rhyton-shaped amphora, and 50 clay figures. The Mogilanska Mound is believed to be a royal tomb connected with the dynasty of the Tribali tribe. The Thracian Tomb of Sveshtari is located near the town of Sveshtari, Northeastern Bulgaria. It is a Getic tomb with unique caryatids and murals dating back to the 3rd century BC, and was found in 1982. It is a UNESCO World Heritage site. The Sboryanovo Archaeological Complex is an archaeological preserve located near the town of Sveshtari including over 140 archaeological and cultural monuments – from prehistoric and Thracian necropolises to medieval and modern-day Christian and Muslim shrines. It includes the Sveshtari Tomb and the ruins of the Ancient Thracian city of Helis, capital of the Getae. In October 2014, Bulgarian archaeologist Diana Gergova discovered a rich necropolis of a Getic ruler (including more than 180 gold items) during excavations at the Sboryanovo Archaeological Complex.